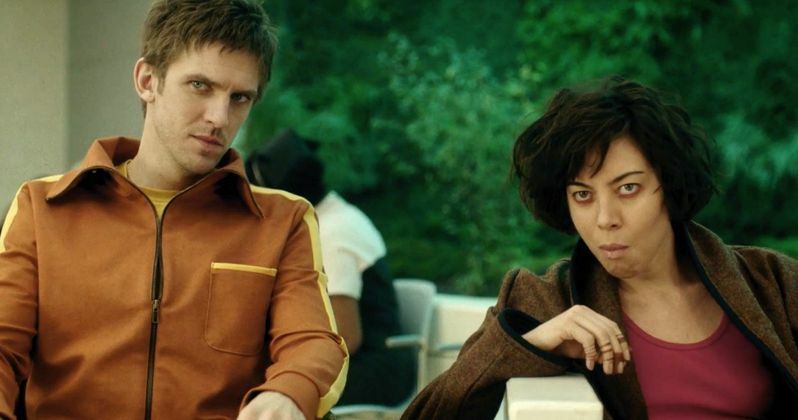 While FX still hasn't issued a premiere date for their new TV series Legion, the network has given fans a first look at the series with two bizarre promos. The first features Dan Stevens as the main character David Haller, along with our first look at Aubrey Plaza as Lenny, both of whom are staring at an unidentified drooling man. The second promo gives us a glimpse at David Haller's incredibly unique mutant powers. The second trailer, which FX Networks debuted on their YouTube channel, features Dan Stevens' David Haller kissing a girl. This kiss apparently triggers his mutant powers, which enable him and the girl to switch places with each other. Unfortunately, both promos are roughly 15 seconds long, so we only get a tiny taste of what is to come, but with the show slated to debut in early 2017, we should see a lot more very soon. While we don't see much of Aubrey Plaza's Lenny, we learned in February that Lenny suffers from addictions to drugs and alcohol, although she is trying to turn her life around. The cast also includes Jean Smart as Melanie, a therapist, described as nurturing yet demanding, who has unconventional methods, and Rachel Keller as Syd, described as a scrappy, optimistic woman in her 20s. It is believed that David is about to give up in his struggle with mental illness when he meets the woman of his dreams, Syd, but that hasn't been confirmed. Legion introduces the story of David Haller. Since he was a teenager, David has struggled with mental illness. Diagnosed as schizophrenic, David has been in and out of psychiatric hospitals for years. But after a strange encounter with a fellow patient, he's confronted with the possibility that the voices he hears and the visions he sees might be real. The cast also includes Jeremie Harris (A Walk Among the Tombstones), Amber Midthunder (Hell or High Water), Katie Aselton (The League) and Bill Irwin (Interstellar). Production on the eight-episode first season began this past summer in Vancouver, with the new X-Men series from FX Productions and Marvel Television debuting on FX next year. Noah Hawley (Fargo) will serve as an Executive Producer along with Lauren Shuler Donner (X-Men: Days of Future Past, The Wolverine), Bryan Singer (X-Men: Days of Future Past, Superman Returns), Simon Kinberg (X-Men: Days of Future Past, The Martian), Jeph Loeb (Marvel's Agents of S.H.I.E.L.D., Marvel's Daredevil, Marvel's Jessica Jones), Jim Chory (Marvel's Agents of S.H.I.E.L.D., Marvel's Daredevil, Marvel's Jessica Jones) and John Cameron (Fargo, The Big Lebowski). Take a look at the first two promos for Legion, and stay tuned for more as we get closer to the premiere in early 2017.